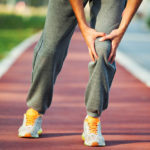 Home » What is Osteoarthritis of the Hip? With our aging population here in Canada, you may have noticed an increasing number of people walking with canes or limping as they walk. Aging translates to wear and tear on our bodies, and our joints are very susceptible. One of the most common ailments as we age is osteoarthritis or arthritis of the bones, often called “wear and tear” arthritis. Osteoarthritis can occur in any of our joints, and the hip is one of its most common locations. The hip is a ball and socket joint; the head of the upper leg bone, or femur, fits into the socket created by the acetabulum, a section of the large pelvis bone. The surfaces of both bones are generally covered with cartilage, a slippery substance that protects and cushions them. Between the bones, there is also a thin layer called the synovium, which produces fluid to lubricate the cartilage to ensure that movement happens smoothly. The cartilage also helps to absorb any shocks that aren’t dispersed by your hip bones. With osteoarthritis, the cartilage begins to wear away and becomes rough in the process. The protective space between the two bones shrinks and, without cartilage, the bones may rub against each other. Bone spurs may also pop up, attempting to compensate for lost cartilage. It’s a slow process, but one that is increasingly painful. 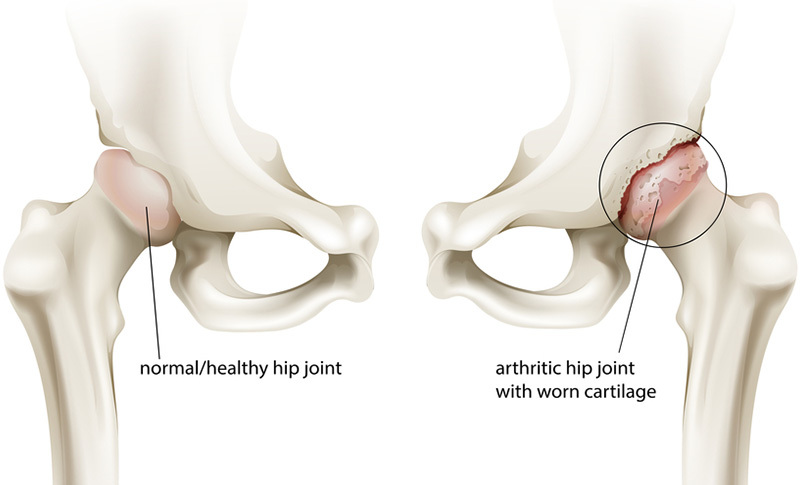 Although the actual cause of hip osteoarthritis and deterioration hasn’t been identified, you are more likely to suffer from it if you have one or more risk factors, including aging; heredity or congenital defects; previous trauma to the joint, such as a broken hip from years earlier or effects of sporting activities; obesity – the hip experiences six pounds of pressure for every pound we gain; and gender – women are more likely than men to experience it. Because hip osteoarthritis is an ailment that develops slowly, people often ignore it until it affects their daily activities. If you have hip osteoarthritis, you may have stiffness in the groin, buttocks or thigh after sitting or lying down for long periods of time, including when you arise in the morning. You’ll will likely have pain that will worsen over time, especially when you put weight on the hip; it may radiate down the thigh to the knee. You may have some swelling, which can weaken the muscles supporting the joint. Your hip joint may lock or stick periodically and there may be a sensation of bones rubbing against each other – a crunching or popping sensation. Walking may be painful and you may unconsciously avoid putting weight on the hip, giving your gait a limping or lurching motion. You may have some loss of function – tasks that require bending, such as tying your shoes, may become difficult, and it may be a challenge to get into a car or a chair. In addition to discussing your history and doing an examination, your doctor will test your range of motion and check for pain points. He/she may order an MRI or an X-ray to confirm the diagnosis. It isn’t possible to reverse the damage done to your hip by osteoarthritis, but you can slow its progress and address the symptoms. 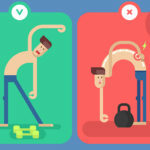 Relieving pressure on the joint through weight loss and/or muscle strengthening are common approaches. For more severe cases, injections and surgery may be suggested. Any approach to treatment should aim to reduce pain and ensuring that you can function well enough to carry on with your daily activities. You’ll need to find the proper balance between activity and rest; inaction simply exacerbates the condition. You can also use a cane in the opposite hand and/or wear cushioned shoes to relieve some of the pressure on the hip when walking. Non-invasive treatment should be your starting point, and physiotherapy is a useful tool to strengthen your surrounding muscles, increase range of motion and reduce pain. Your physiotherapist will start by manipulating your hip, moving on to designing a course of stretching and strengthening exercises. Osteoarthritis hip exercises can also decrease stress on the hip and increase stability. 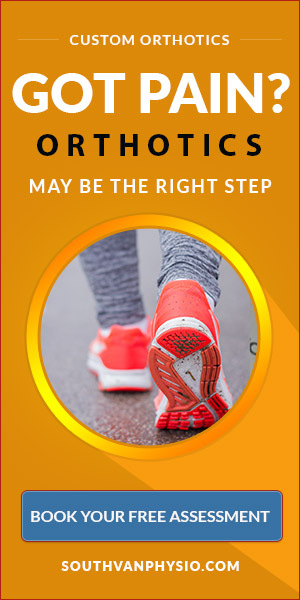 They may also help you modify your gait. You’ll want to minimize activities, such as running, that cause pain and try those, such as swimming, that don’t place stress on the hip. You may also consider more invasive options. Your physician may suggest steroid injections to reduce swelling or hyaluronic acid injections that provide lubrication to the joint to make movement easier. They don’t work equally well for everyone, but if they are successful, the impact lasts anywhere from six months to a year. 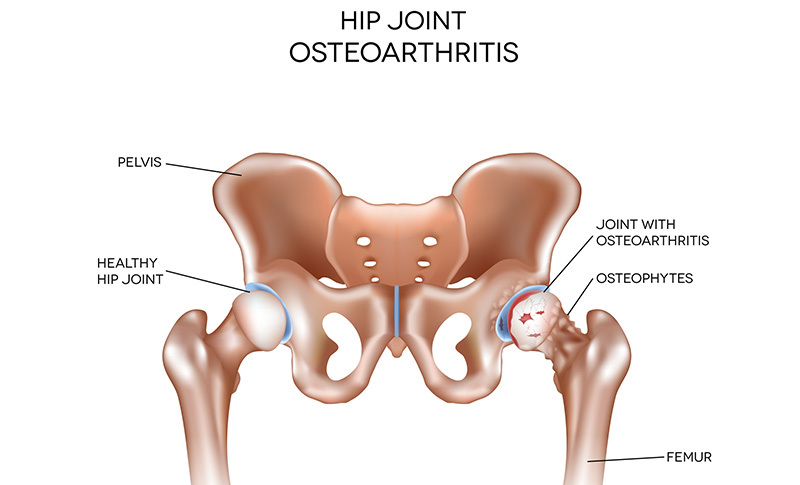 Surgery is the most drastic response to hip osteoarthritis. If the osteoarthritis is having a major impact on your lifestyle, you may want to consider it. There is arthroscopic surgery that can be used to remove bone spurs or loose pieces of cartilage; osteotomy that reduces friction by aligning bones properly; and total hip replacement, which replaces your joint with an artificial one. Discuss these possibilities with your physician if the osteoarthritis becomes severe. Finally, don’t take your condition lying down (you’ll get stiff!). 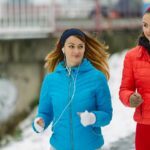 Be proactive in addressing it by staying active, losing weight and adopting a course of exercise that will strengthen the muscles around the hip. Let’s get you some relief. 2nd floor of Superstore, 10-350 SE Marine Drive, Vancouver, B.C., V5X 2S5 (see Google map here). Graduating from the Massage Therapy Program at Vancouver Career College, Hongmei is equipped with extensive knowledge and experience to heal and relax the human body. What sets Hongmei apart is her background in engineering and experience as a traditional Chinese masseuse. This has allowed Hongmei to effectively design and execute treatment plans that not only treat specific areas of the body, but to also view and treat the patient comprehensively. Hongmei is highly trained in massage therapy techniques that enable her to successfully treat patients with; motor vehicle injuries, chronic overuse soft tissue injuries, postural dysfunction, neurological conditions, muscle spasms, headaches, anxiety and much more. Whether you are looking for a specific technique or a creative combination of a few, Hongmei does it all! – Including: Swedish massage, deep tissue massage, fascial work, joint mobilization, traditional Chinese massage and foot reflexology just to name a few. In her spare time, Hongmei enjoys appreciating what nature has to offer, whether it be hiking or gardening. Kevin graduated from the Kinesiology program at the University of British Columbia with special interests in active health and rehabilitation. Throughout his schooling, Kevin worked as a certified personal trainer and a cardiac rehabilitation program instructor. Kevin has experience working with patients of all ages and a wide variety of physical abilities. Currently he also works at Vancouver Coastal Health’s knee and hip replacement program. There he applies many of the strength and conditioning principles he learned coaching varsity sports at UBC and applies them to the clinical setting focusing more on rehabilitation and return to work goals. Kevin believes that exercise and physical activity are crucial components in physical recovery and overcoming pain. He believes in educating his clients about their conditions and developing goals to get people back to life, work and sports. Practice what you preach; Kevin is an avid weight lifter, loves badminton, soccer and on his days off enjoys salsa and hip hop dancing. Trevor completed his Master of Physical Therapy and Bachelor of Human Kinetics from the University of British Columbia. 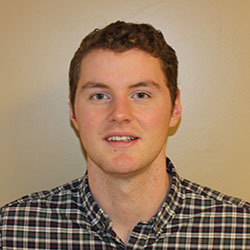 As a clinician, Trevor has a special interest in sports injuries, chronic pain, and orthopedic rehabilitation. He is an advocate of evidence-based practice, and believes that education and exercise therapy are fundamental to improving rehabilitation outcomes. Currently, he has completed his Canadian Physiotherapy Association Orthopedic Division Level 1 certification, and continues to be involved in continuing education. Trevor is a proud member of Physiotherapy Association of British Columbia, and continues to promote physiotherapy throughout the community through volunteering. On his weekends, Trevor enjoys spending his time in the outdoors; skiing, rock climbing, and fly-fishing. Jaspreet graduated as a physiotherapist from Guru Nanak Dev University in India in 2011. She is passionate in providing the best quality treatments and outcomes to her patients. Jaspreet has a strong work ethic and interpersonal skills and enjoys participating in a collaborative team approach at work. (Honours) in exercise science and lifestyle management from Humber College, Ontario. Clinical expertise and experience in a variety of areas with particular emphasis on outpatient orthopedics and athletic injuries. Experience as a personal trainer at Humber College, Toronto. 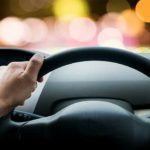 including both hospital and private practice, treating acute, chronic and sports injuries, whiplash associated disorders, work related injuries, various musculoskeletal impairments, TMJ dysfunctions and post-surgical conditions. Jaspreet also has experience with a multitude of neck, back, joint aches, pains and a variety of medical conditions and dysfunctions. 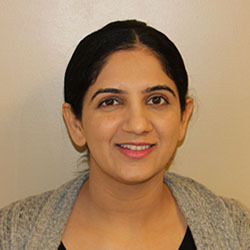 Jaspreet is also involved in continuing education, workshops, seminars and research to keep her skills up to date and is constantly learning new ways to help her patients. Jaspreet believes in educating her patients about their conditions and post treatment home programs to help improve their quality of life and reach their desired goals. Languages spoken: Jaspreet is fluent in English, Punjabi and Hindi. Jaspreet’s other favourite pastimes include; reading, meditation, volunteer service, badminton, traveling and hiking. Ronak Kapadia completed a Bachelors of Physiotherapy at the Health Sciences Dept. of Rajiv Gandhi University in India where he underwent intensive training at an 810 bed hospital. He has worked a physiotherapist in hospitals, orthopaedic clinics, community and university settings. After gaining a few years of work experience Ronak pursued and successfully completed a Masters degree in Physical Activity and Health from University of Erlangen-Nuremberg in Germany where he was involved in research projects and received further clinical training. Ronak has a special interest in orthopaedic and neurological conditions. He has specialized training in manual therapy techniques as well as a Yoga certification from India. He has extensive experience in dealing with musculoskeletal pathologies, sports related injuries as well as neurological conditions. He believes in hands-on therapy and applies manual therapy techniques in many of his treatment sessions. 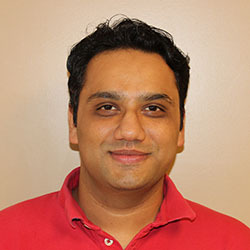 Ronak believes in lifelong learning and yearns for knowledge by researching and engaging new strategies and techniques to further help his clients. Ronak is a very passionate and client focused physical therapist. He has a very pleasing personality, professional attitude and takes utmost care of his patients in order to obtain the best clinical results possible. In his free time Ronak likes to sing, play music, meditate and go for a walk. Deepika graduated with a Bachelors of Physiotherapy from Pravara Institute of Medical Sciences, Maharashtra University of Health Science in India in 2007. She was University topper and Topper of her College with distinction in Psychology during her bachelors. (This means top of her class.) In addition, she holds a Masters degree in Global health and Human Administration services from Fairleigh Dickinson University, New Jersey, USA (2013). She worked as a Registered Physiotherapist in India in both hospital and clinic based settings. Deepika immigrated to Canada in 2012 and completed a Canadian Healthcare Content Course at University of Toronto. She then finished her IEP program from UBC in 2015 and has passed the written and practical component of the Canadian Physiotherapy National Exam. 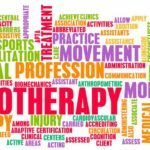 She uses integrated manual therapy with exercise prescription to treat Orthopedic, neurological, sports, work related and motor vehicle accident injuries. Her areas of interest are sports injuries, chronic pain, neurological conditions, post op patients and exercise prescription. In her physiotherapy practice, she works hard to educate each of her patients on strategies for self-care and integrating exercise into the daily schedule. She strongly believes that good communication and follow-ups are important factors in ensuring continued care and managing a healthy lifestyle. Deepika is fluent in English, Hindi and Marathi and understands and speaks some Punjabi and Gujarati. In her spare time, Deepika helps students preparing for the Canadian National exam to become registered physiotherapist in Canada. Her hobbies are dancing, swimming and travelling to new places. Parneet Sandhu is a registered physiotherapist with more than six years of experience; 4 years in India and two years in Canada. She obtained her bachelor’s degree in Physiotherapy from one of the most reputed universities in India and subsequently completed a Masters in Administrative Sciences in BC. As a former international athlete with an ongoing interests in health and fitness Parneet integrates her philosophies and experiences into her physiotherapy practice. Parneet follows an evidence based treatment style and coordinates with other health professionals in circle of care in order to improve treatment outcomes. She is experienced in treating patients with a variety of conditions such as orthopaedic, neurological, work related injuries, motor vehicle accident injuries, sports injuries, post-operative rehabilitation and much more. Parneet uses her diverse skill set to empower her clients in reaching their desired goals. Parneet is also certified in Functional Dry Needling. In her free time Parneet keeps her sporting spirit alive by hiking and exploring new places. Jonathan Heilbrunn is a Registered Physiotherapist and graduate of the University of Western Ontario. The key to successful rehabilitation must involve educating patients on their diagnoses or injury and to help them to improve their quality of life and regain independence. Jonathan is an avid snowboarder, weightlifter and fitness buff.